It was always going to be ambitious scheduling this race, classified as 'severe' by EnduranceLife, just a week after the Thames Trot. When I entered, the plan was still packing in the long stuff for the Thames Path 100 early to leave a shot at a decent London Marathon in between. As last year's soleus tear injury has dragged on those plans have had to change. The London Marathon has been downgraded to a Comrades qualifier and the speedwork I thought I'd be working on now is as rare as a sandbag in B&Q. Probably for the best, let's face it. The 2013-14 UK Winter is going to go down in the record books for the wrong reasons and Devon has been one of the worst-hit areas. The Thames Trot had been radically re-routed and this race was if anything under more threat but EL's status updates suggested it was going ahead and their planned final notice was due after I had to leave so I headed out for the M4. 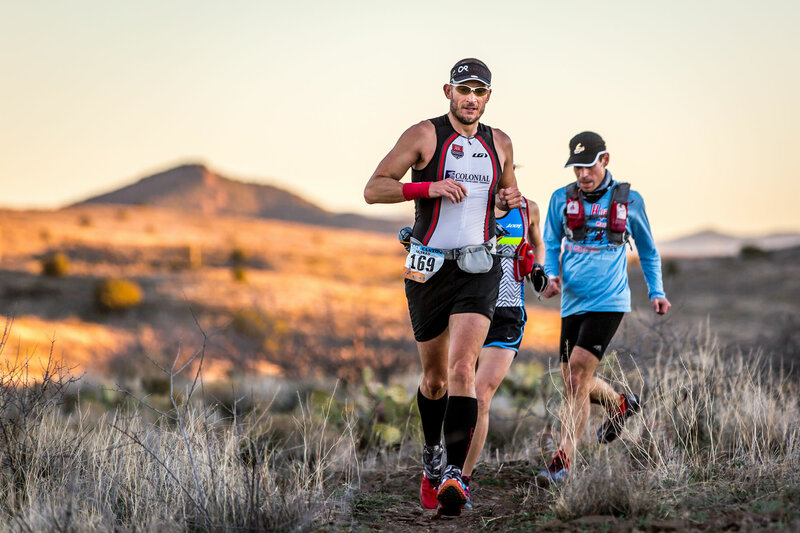 In any case one of my oldest schoolfriends, back from the days when the idea of an ultra would have meant a second lap of the playground, lives close to the race and the chance to catch up after several years proved irresistible. I'll cut to the chase rather than regurgitate all the catch-up chat from the Friday night! 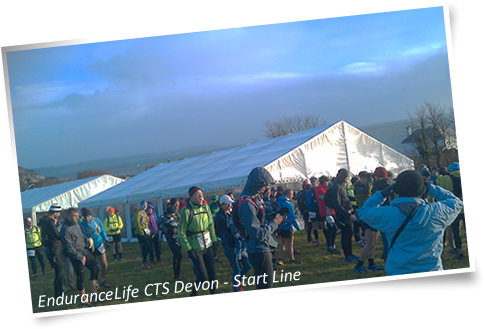 I was only staying about 24 miles from the start but I was taken aback by how slow traffic moves about in rural Devon and had to head off before 6:15am to make Beesands in time for registration and the start. It's pitch black, blowing a gale and there's water everywhere so the trip down to the coast through some ridiculously narrow lanes is very stressful. I was relying on my phone's sat nav guidance but I should have learnt from past experience as the signal vanished, closely followed by the guidance and then finally by the very touch sensitivity of the screen. I ended up in Slapton (not that I knew that) which is like driving through a model village, the roads being designed for an especially slim donkey and cart. I saw an old boy with his dog and asked directions only to instantly regret it as the time ticked away and the old fella rubbed his chin thoughtfully and after what seemed like 10 minutes came out with the classic 'you wouldn't be wanting to start from here'. Eventually I'm given 3 different and complex alternatives, none of which I can remember beyond step 1 - 'carry on up there'. So I carry on up there and eventually find what looks like it might be the sea in the pre-dawn light, head towards that and, using the force and a welcome race sign, find the parking. It doesn't look promising as the sky is battleship grey and the wind is driving more effectively than I'd just done to get there. As with all EL races you have to register in advance, pick up your timing chip wristband and t-shirt and other bits. As with the last EL race the weather is so unpromising I decided to add the souvenir shirt to the race wardrobe and head to the briefing. The race route has been mangled out of all recognition thanks to the floods and probably more likely the extreme winds which have rendered a lot of the coastal path too dangerous to use. Beach sections have been sacrificed in favour of more sheltered paths though there's still much more trail than roads which is welcome after the TT50 last week. One feature they keep is the recycling of various bits of the route to make up the longer distances. Usually their ultra is the marathon followed by the 10k but this time it's 20-mile route back to the start followed by the half marathon route (which is itself the same as the 20 but without the middle third). The briefing leaves no doubt that this was going to be tough and like the earlier driving directions all I can remember is 'carry on up there'. We get started around 8:30am and incredibly the sun comes out and the wind seems to die down and not for the first time a false sense of security and optimism is instilled as we head out onto the first climb up to the cliff path. 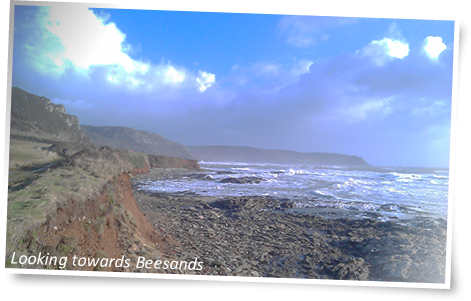 This is a beautiful part of the world and within a few miles the view back along the coast is spectacular. The whole course is flooded and boggy and the wind is driving spume off the crashing waves onto the path and making even placing your feet where you want difficult. After the multiple immersions at the TT50 though this was nothing! I felt completely unscathed after the TT50. Getting over that was a case of a single day off and an otherwise pretty easy week but there was no residual tiredness or aches. The technical course here was completely different with serious gradients and I probably benefited from using different muscles, the softer terrain and the sheer impossibility of running quickly. Up until past checkpoint 1 and the course split for the 20 mile lap and the half marathon it's all pretty pleasant. Apart from the footing being difficult it's not half bad out there. But that was not to last. The next several miles are exposed to the full ferocity of the wind and the path is relentlessly rising and falling on the kind of narrow, rocky trails that I'm completely crap at. The weather closes in, the sun vanishes and in one valley and inlet in the bay the wind is driving the seawater horizontally across the course. It's quite surreal to see - a wall of water ahead and it's like going through a car wash. As I climbed up the other side of the valley with a couple of other runners a hailstorm breaks and we are blasted with grape shot. The bandana thing I'm trying to fend them off with is pretty hopeless and as yet another ice shard gets me square in the left eye I'm starting to think we're going to need rescuing off the course! Putting your hand down to stablise invariably has you wrist-deep in that spiky gorse stuff which feels initially quite soft but then cuts to ribbons. Fortunately after a few minutes the hailstorm passes (for now) and by the second checkpoint the course has reached a sheltered bay (I think Salcombe is on the other side of it), the sun is back out, the wind has gone. It's night and day. There's some soft trail with the sun streaming and dappling through a grove as I put away a chia flapjack; struggling with the wrapper as my hands are completely numb. The 7ish mile loop returns us past the carwash (it seems to have vanished by now though) and the technical trail. I've much to learn about this stuff. I just don't have the balance to tackle it properly or for that matter the confidence to either. On steep downslopes I always end up tip-toeing tentatively trying to resist the gradient but it never works and I always end up on my backside. 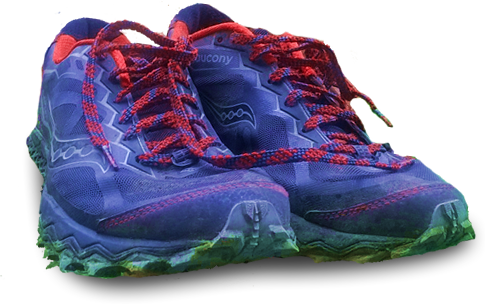 At least this time I'm using trail shoes (the Salomon Mantras) but their sole lugs aren't aggressive-enough to cope with this amount of mud. As the course rejoins the half-marathon route it's now about 7 miles back to the start tent. It's the muddiest and wettest section of the course with a few more doses of hail for good measure. Much of the trail is shin-deep mud ploughed up by tractor tyres and invariably there's a river of flooded surface water running through it. By now soaked and covered in the very red mud they have around here, not that that bothers me all that much. I've already decided to call it a day at 20 miles. After last week it's enough and I just don't think this is really training - at least not running training. Mental training, yes. We've already run the route as well so knowing what's in store which doesn't help! I'm more worried about falling after many close calls - I can't afford to sprain anything or worse. There are only 52 finishers in the Ultra so it's clear a large proportion of the field (about 50% by the look of it) agree! One last breakneck descent back to the start/finish tent and a medal (which I just about convince myself I've earned), a steaming cup of tea and a long-since stopped steaming meat pastie. So, stunningly scenery and it would be a fantastic route on a better day for it. My last EL race over the Seven Sisters was also afflicted with less-than-ideal weather. One of these days it'll all come good and the course will be shown off to its full eye candy potential. 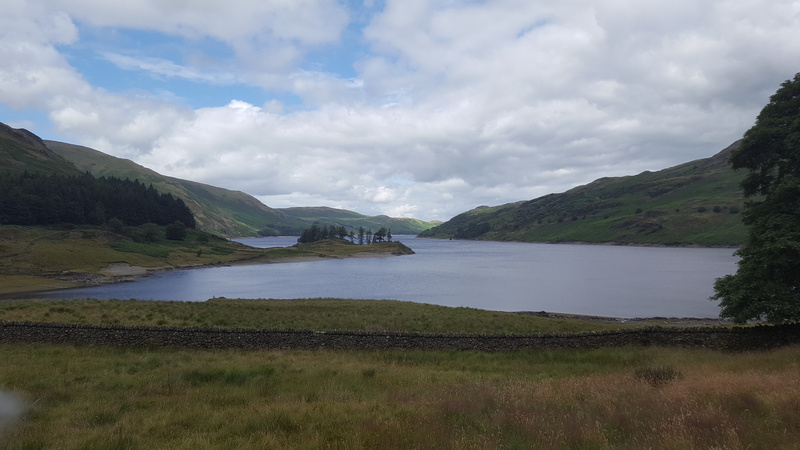 I'm pleased with the rapidity of recovery from the TT50, the 20 miles of gradients has been useful and I follow it up with a 15-miler on the Sunday. 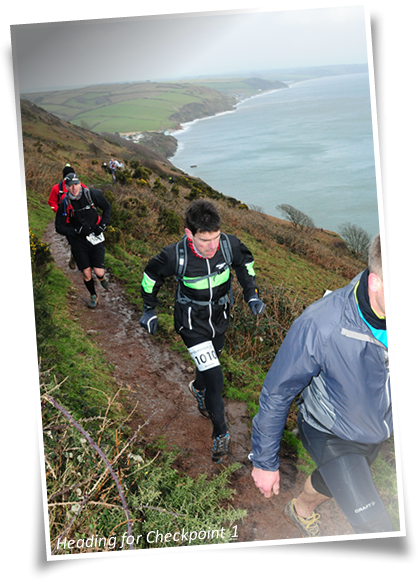 Credit to EnduranceLife for putting on a race in those conditions. I'm sure a lot of work went into that right up to the start behind the scenes. Next one up is the St Peter's Way 45 which is already looking like another mud-fest!